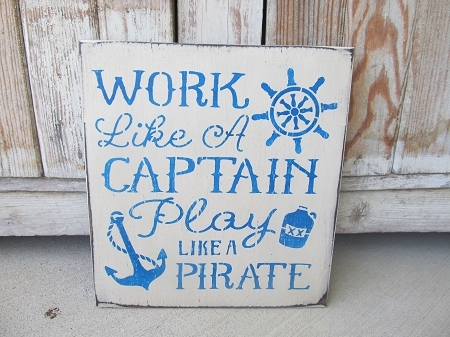 Nautical Beach Rustic Work Like a Captain Play Like A Pirate Hand Stenciled Wooden Sign. I love the saying on this sign. 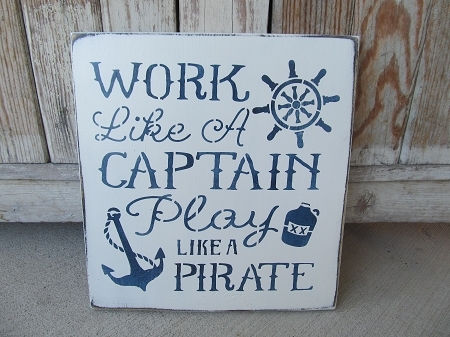 A fun nautical beach themed sign for your home's decor. Shown in the Marshmallow background with Velvet Rope Blue Lettering. Other color options are available. The sign has been sanded and stained for a rustic look. Size is 12"x12" and has been painted on a 1" thick pine wood board. Choice of hanging methods are available. Hand painted by Heidi.